Derived from the lovely purple flower, lavender oil is adored for its pleasant fragrance that could easily brighten up your day. Just a handful of the dried petals of the flower emits a beautiful scent that can erase any unpleasant smell, like in the bathroom. You can make them fresh if you have lavender around. Lightly crushing them between your fingers release its oil that us simply intoxicating. There are a variety of uses for lavender oil, be it potpourri, aromatherapy or even used for its antiviral and antibacterial properties (Which is why lavender can often be found in cleaning products such as detergents and soaps). Moreover, they are excellent for healthy skin and relieve you stress away with just a few sniff. How to make lavender oil? It’s fairly easy to do, with little ingredients, but you will need some patience. Learn how to make lavender oil and how to use them now. The most important ingredient will, of course, be the lavender flowers itself. Fresh ones are the best since they produce a more pronounced and, well, fresh scent. Other than the petals, you can use the trimmings of the plants as well (leaves, stems that isn’t overly woody or barky). Get around two to four cups of the ingredients. Scissors will be all you need to cut the plants trimming into tiny manageable pieces, we will need them to fit inside a jar. They should be one to two inch long, smaller if possible. Glass container for brewing your oil. Make sure it has a tight fit lid such as a canning jar. Carrier oil for infusing the lavender with. Use one that has a mild scent and pale colour so as to not overpower the lavender, such as vegetable oil. How much you need depends on the size of the container, make sure it’s enough to fill to the top, leaving about half an inch of space and enough to cover every plant material you are going to add. Cheesecloth or fine mesh strainer. You will need it to strain out the plant pieces. Dark colored glass bottle with an air tight lid is recommended for storage. Place all the lavender pieces into the glass container and fill it to half an inch from the brim with the oil of your choice. Seal the lid tight and leave the container in a warm area for the ingredients to brew. Shake them from time to time so they mix properly. Let it sit for around two days, more if you are willing to wait. The lavender will infuse with the carrier oil through the process and your lavender oil should be of lightly scented by then. If you can’t find a warm area for your container, then fill a bucket or sink with hot water and set the container in it. Refresh the water as you need and you will still need to shake to mix the ingredients together. Then leave it to set overnight. Grab your fine mesh strainer or cheesecloth. Strain the oil out, removing any of the plant parts. Squeeze out as much oil as you can. You will then need to place in more of the plant ingredients. Repeat the process for a couple more times until you reach the desired fragrance. Once you are happy with the scent, transfer the infused oil in the dark colored glass bottle. Store in a cool dark place for preservation. If properly sore, it could last a year or so. 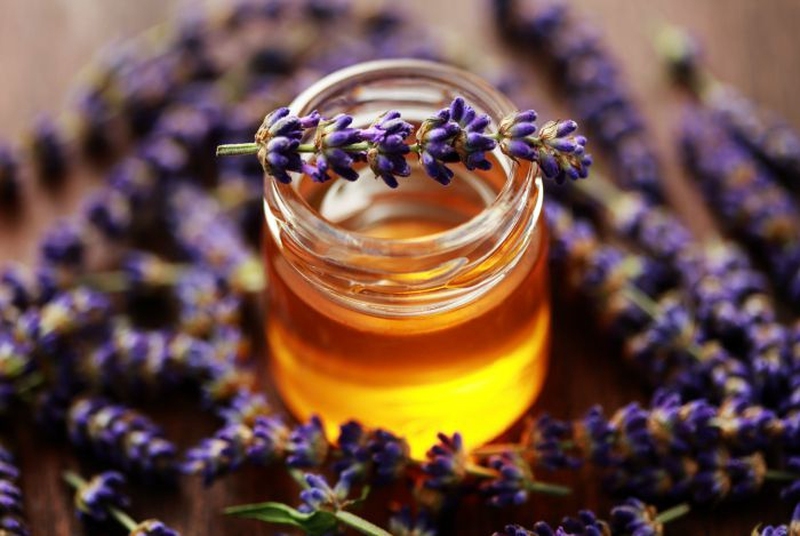 Many insects dislike the scent lavender made for whatever reason, so the oil makes for an effective bug repellent against pesky critters such as moths, midges and mosquitoes.Rub some of the oil on your skin when outdoors and you will avoid all the irritating bugs. In addition, it doubles as a bite treatment, so if you ever got bitten by one, you can apply some of the oil over it and the anti-inflammatory properties will kick in to quell the pain and irritation. The scent helps you relax and even induces sleep, so the oil is often recommended as an alternative insomnia treatment. Studies had shown that elderly patient using a lavender scented pillow enjoys more regular sleep, even when in comparison to the ones who used sleeping pills. Consider it next time you have trouble sleeping instead of blindly going for off-the-shelves sleeping medication. Aromatherapist and dermatologist acknowledge lavender oil for its effective acne treating ability.For those of you going through puberty or having breakouts through adulthood, why not give it a try? Acne developed on your body and face because of bacterial infections close to the sebum gland, inhibiting proper sebum secretion out of the skin on your face. As it builds up, especially if you are in puberty since the hormone imbalance produces too much sebum and the bacteria feed off them, red sores formed over the skin and this is what we call acne. The essential oil of lavender gets rid of the bacteria causing the infection in the frist place. At the same time, it helps to regulate the sebum production and so scarring from acne is minimised afterwards. Apply few drops of the infused oil along with whatever cream and ointment you are using to significantly boost the potency for relieving the acne. Apply some of the lavender oil for the sores and muscular pain all over your body after a long day. Massages with the oil can really relieve the joints related pain. If you need more evidence, a study was done on postoperative treatment to relieve pain. A patient who received the lavender oil vapor in their oxygen tube felt significantly reduced pain than the ones who are only hooked onto regular oxygen. Unsurprisingly, the essential oil proved to be excellent to eliminate nits, lice and its eggs on your hair. Not only that, hair loss treatment incorporating the oil has been shown for being more effective, especially for those suffering from alopecia (an autoimmune disease that causes the body to reject hair follicles). A Scottish study discovers that more than forty percent of the patient reported more hair growth when the essential oil is rubbed regularly on the scalp. If you are a male that cares about your hair, give it a try to prevent baldness in the future. The oil is beneficial for digestion since it makes food go down your intestine easier. It also promotes the production of digestive chemicals such as bile and gastric juices, therefore, helps to treat stomach related problems such as stomach pain, colic, vomiting, flatulence, diarrhea and indigestion.